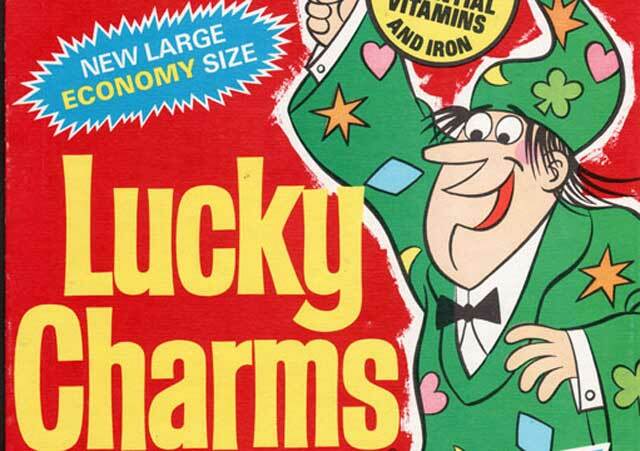 General Mills attempted to replace L. C. Leprechaun in the mid-1970’s. Waldo the Wizard, a man in a green wizard’s cap and gown (and black sneakers on his feet), appeared on boxes in 1975. “Ibbledebibble delicicious”. Waldo was created by Alan Snedeker, and designed by Phil Mendez. It was a test to find a replacement for the leprechaun. Officially, Waldo proved to be less popular than “Lucky” and magically disappeared from boxes one year later. For a whole year Lucky the Leprechaun was out of the public eye, probably chained to some radiator in the General Mills HQ being interrogated as to the whereabouts of various marshmallow precious stones. Can you imagine what this universe would be like if those nefarious plans went through? I’m no quantum physicist and I’ve never seen The Butterfly Effect but here goes: no more puffins, laser guided herpes and President Christian Slater. The General Mills “Monster Cereals” (Frankenberry, Count Chocula, Boo Berry) used to include the varieties Yummy Mummy and Fruit Brute. The Boo Berry ghost has always looked high. In addition to Snap, Crackle, and Pop, there were originally plans to have a fourth Rice Krispies mascot named “Pow”. Post Sugar Crisp (later, Golden Crisp) was originally represented by three bears Dandy, Handy, and Candy who were portrayed in real life by a trio of costumed little people. Downsizing removed two, with the survivor mutating into the smooth-talking, turtlenecked Sugar Bear. If whatever you are doing has any utility whatsoever, stop it and blow two hours reading about cereal mascots. It’s the only humane thing to do. Image from the equally indispensable Cereal Bits Cereal Box Archive. Pingback: 12 Forgotten Cereal Mascots | シ最愛遲到. !